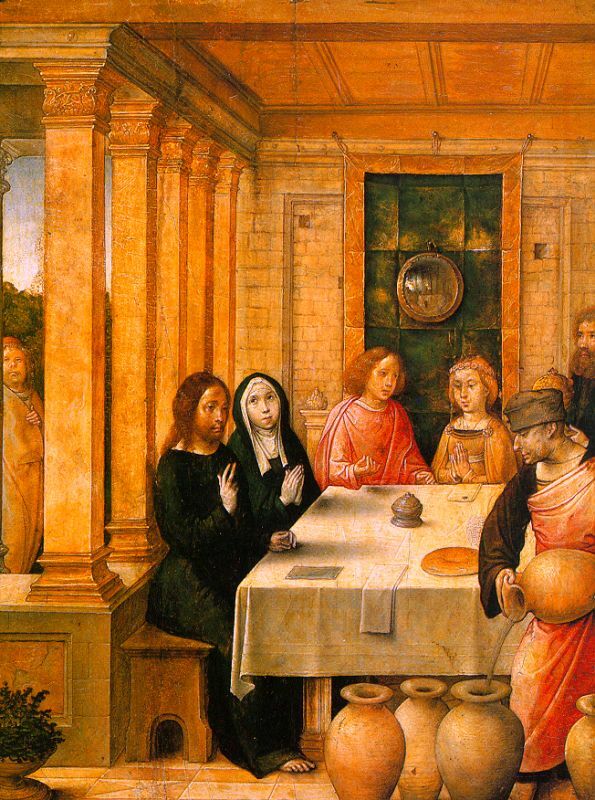 The first miracle that Jesus did was at a wedding feast in the town of Cana in Galilee. 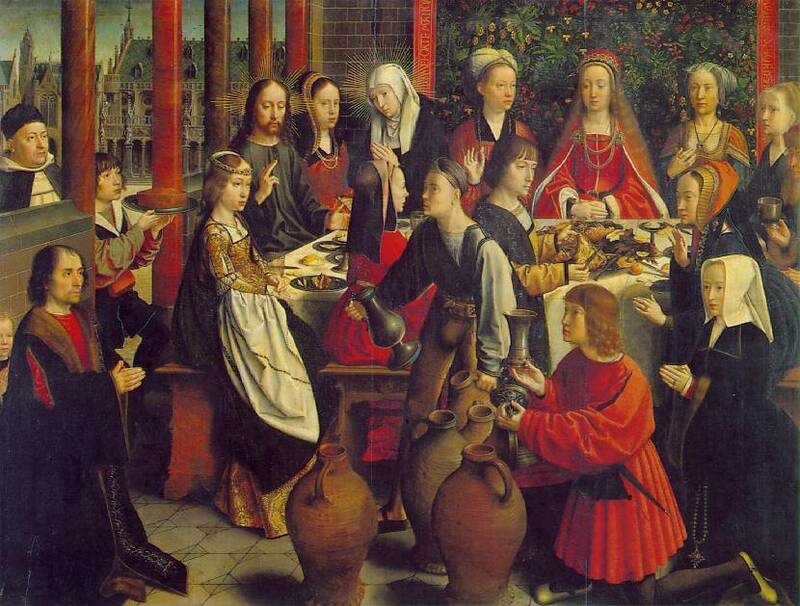 Jesus' mother, Mary, told Jesus that the wedding host was out of wine. 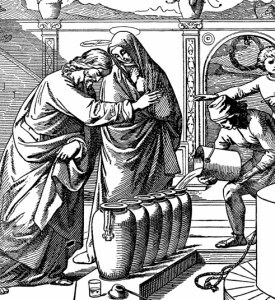 Jesus told the servants to fill the water pots with water and then when they dipped it out, there was wine in the jars. Jesus had turned the water into wine. Jesus and his disciples were out on the lake when a storm suddenly came up. Jesus was asleep in the boat and his friends were afraid. They woke him. He got up and told the storm to stop and it was completely calm; the wind stopped blowing and the water was still. His disciples were amazed! "Even the winds and the waves obey Him," they said. 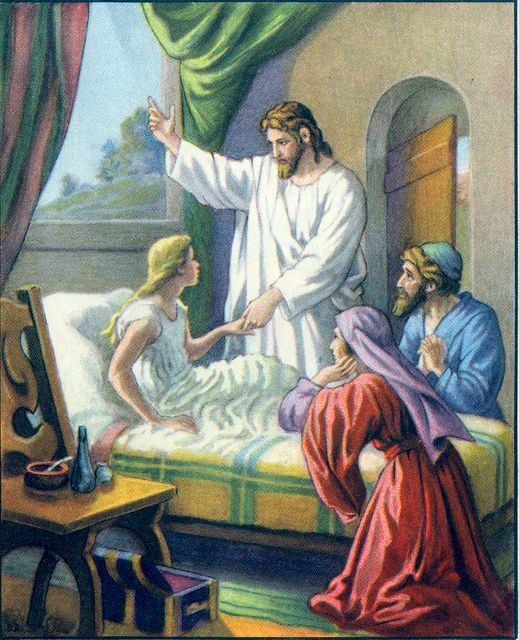 Jesus healed Simon Peter's mother-in-law who had a dangerous fever. She got up and served them. He healed the nobleman's son without going to the child. He once cleansed a leper, but warned him to say nothing. However the man spread the news to all around. There was a man in Jerusalem who had been blind from birth. 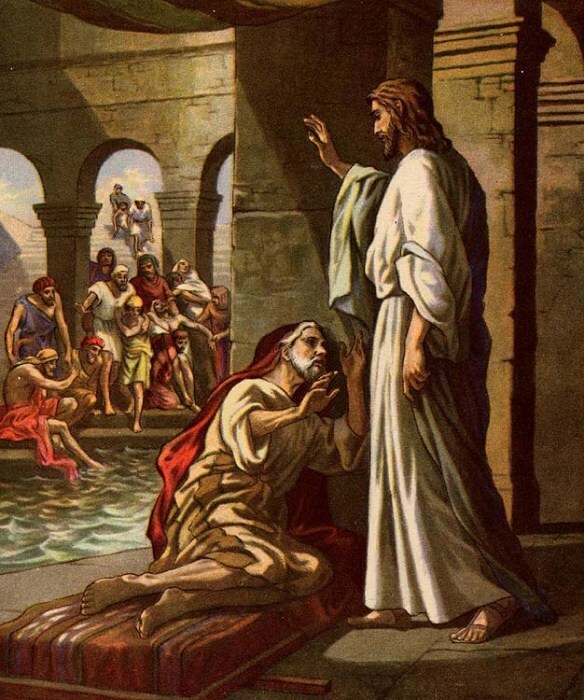 Jesus put clay on the blind man's eyes and told him to go wash in the pool of Siloam. When he washed the clay off, he could see. Once in Jerusalem, a blind beggar named Bartimaeus asked Jesus for mercy and healing. Jesus told him that his faith had cured him and the man praised God for his sight. There was a paralyzed man in Capernaum. He couldn't walk, so his friends took him to see Jesus. There was such a crowd that they could not get him into the house where Jesus was. They made a hole in the roof and let their friend down through the roof. Jesus told him that his sins were forgiven and to rise, take up his bed and go home. Some of the people doubted Jesus at first, but they were then amazed as the man stood up straight and tall. Ten men who had leprosy asked Jesus to help them. Jesus was not afraid of the disease. He told them to go and show themselves to the priests, and as they were going, they were completely cured! Only one of the ten lepers ran back to Jesus and fell down on his knees and thanked him. Jesus turned water into wine, controlled nature, and healed all kinds of diseases. These miracles proved he was sent from God. If we believe God and Jesus created all things (and we do believe this), changing water to wine or healing a lame person would be a very easy thing for Jesus to do. As the Master of the Universe, he has power over all things. Let Him control your life as well. The choice is yours. English Bible Activities Select stories about the miracles in the list for activities to accompany this Bible story. Spanish Bible Activities Select stories about the miracles in the list for activities to accompany this Bible story. Press "Go" to search for books about The Miracles of Jesus. Thanks for the lessons and crafts. They are most helpful to me and the Sunday school Dpt. at our church. This website has proven invaluable to me in planning the curriculum for the year for our Children's Church Ministry. Thanks so much and may God continue to bless all of your efforts in providing clear and concise presentations for children. May the Lord Jesus christ bless all. I am giving a talk in church on "tell me the stories of Jesus." This site is great and has helped me. Thanks! This page displayed 352,718 times.